April 8 marked the conclusion of a productive session of the Maryland General Assembly. Regrettably, it ended on a somber note as we mourned the loss of Speaker Mike Busch, a dedicated public servant and mentor to countless Maryland leaders. Throughout his life, Speaker Busch embodied the definition of a true statesman. His presence and leadership in our State’s House of Delegates will be sorely missed. It was an honor to have served under him during my time in the House. This year was my first as the 45th District’s State Senator. I was honored to serve on the Senate’s Budget and Taxation Committee, which plays a critical role in overseeing the funding for many projects underway in Baltimore City. 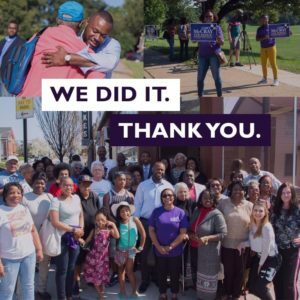 #TeamMcCray’s major initiative this session was to focus on an issue that affects all of us but especially affects our State’s working class families: a raise in the statewide minimum wage to $15 an hour. Put simply, those who are working full-time jobs in our state should not have to worry about being able to afford basic necessities like groceries, living expenses, and childcare. Though Governor Hogan vetoed this legislation after it passed the Senate and House with overwhelming majorities, the General Assembly rallied behind an override of the Governor’s veto. A $15 minimum wage will be in effect by January 1, 2025. Under SB 39, the BPD Commissioner will be required to prepare a plan for redistricting the Department’s police districts following each decennial census. In doing so, our City will be able to ensure that law enforcement resources are properly allocated both according to need and population. SB 41 requires the BPD, which is a state agency, to undergo a regular audit by the Office of Legislative Audits to evaluate the effectiveness and efficiency of the Department’s financial management practices. The Governor’s Office of Crime Control and Prevention provides grants to the BPD to assist in its policing efforts. SB 91 will require the BPD to report on how those grant monies have been used to further community policing efforts in the City. Under SB 33, licensed home inspectors will not be able to make certain certifications relating to pest control unless the inspector is certified as a pest control consultant, pest control applicator, or public agency applicator. Likewise, an inspector will not be able to make certain certifications relating to electrical systems unless they have completed a specified amount of electrical training. The Summer SNAP for Children Act will provide additional funding to supplement benefits received under the Supplemental Nutrition Assistance Program (“Food Stamps”) for children. In doing so, we’ll be able to ensure that our State’s children are not going hungry in the summer months when they no longer have access to school-provided meals. 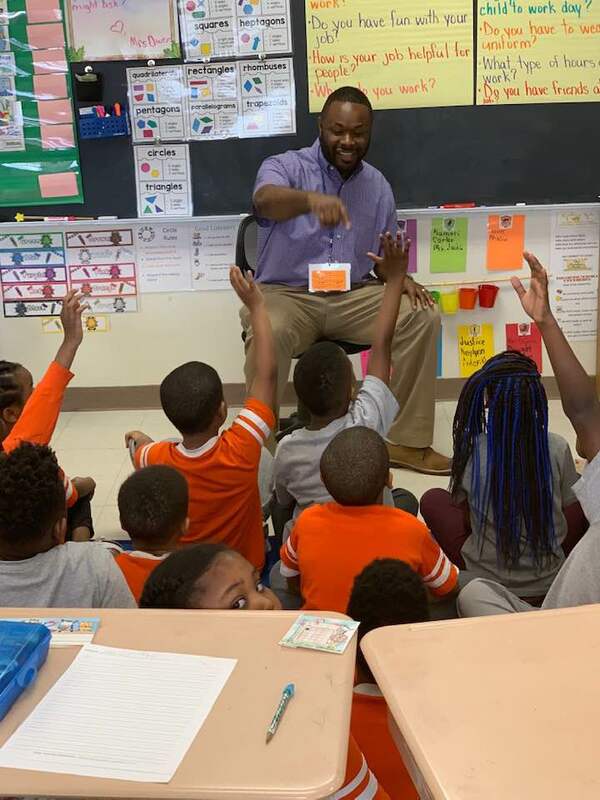 In celebration of career day, I had the chance to talk with a number of bright Pre-K and 2nd Grade students about being a union electrician and Maryland State Senator. It’s never too early to start having conversations with kids about the importance of finding your passion and turning that passion into a fulfilling career. Thank you to Principal Slayton and her team for the energy and love they give to our young people. I enjoyed serving as the guest speaker for this month’s Democratic State Central Committee Meeting. After a productive 90 days in Annapolis, it was a great opportunity to talk about the progress we have made – and the work that we must continue in the coming months and years. I also joined community leaders at the Frankford Improvement Association to discuss the session. 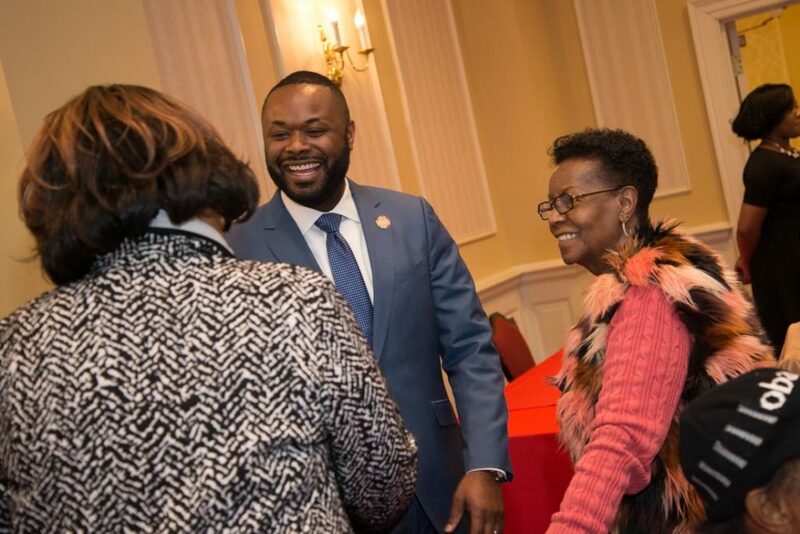 At the end of last month, the 45th District Delegation hosted our annual “45th District Night” in Annapolis to hear from constituents and talk about the status of a number of bills that would positively impact our neighborhoods. You are cordially invited to join me for a Post-Session Celebration Fundraiser on Thursday, May 30 at 5:30 PM. Tickets can be purchased here. If you are unable to attend but would like to make a donation, you can also do so at this link. 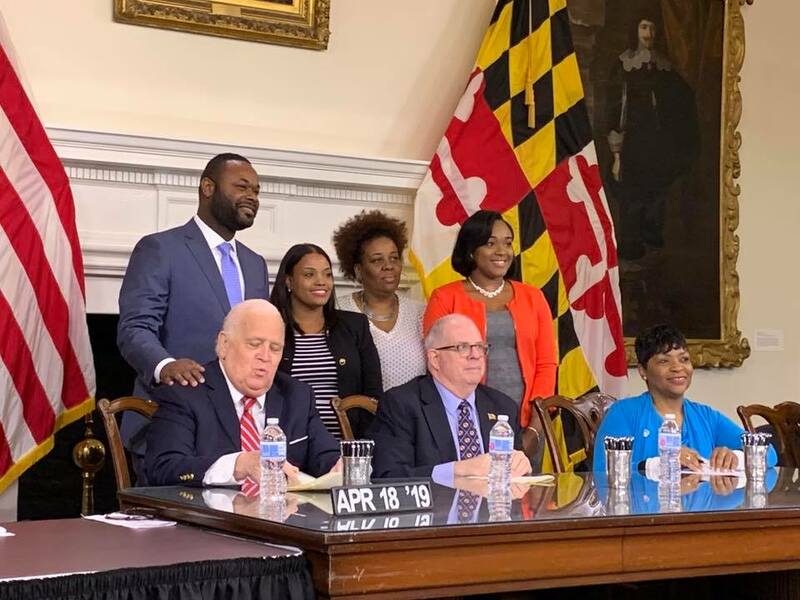 #TeamMcCray’s signature piece of legislation this session, which will increase the minimum wage in our state to $15 per hour, has passed in the Maryland Senate. For the many Maryland families who struggle to afford basic necessities and must confront tough decisions about working multiple minimum wage jobs, this pay increase could be the difference between being able to make rent or knowing that they’ll be able to afford groceries for the week. Fundamentally, this is legislation that supports working class families in the State of Maryland. I recently sat down with Comcast Newsmakers to talk about this—and other—legislation. You can view that segment here. You also have probably heard about a proposal to create a police force for Johns Hopkins. 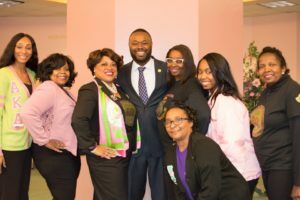 This bill, Senate Bill 793, has garnered a significant amount of conversation in the legislature as well as in communities and among the news outlets. After attending a meeting in the 45th District about the issue, I dived into the specific policy language to make sure that issues raised by our community were addressed in any legislation that advanced through the Senate. In particular, I worked on issues concerning defined geographic boundaries, the vetting of the accountability board, local hiring, a 10-year sunset provision, restrictions on the ability to police adjacent communities, limits on the size of the police force, and reporting requirements for the police force. I will continue to be active in this process as the session continues. You’re invited to two 45th District events that will be taking place this week! 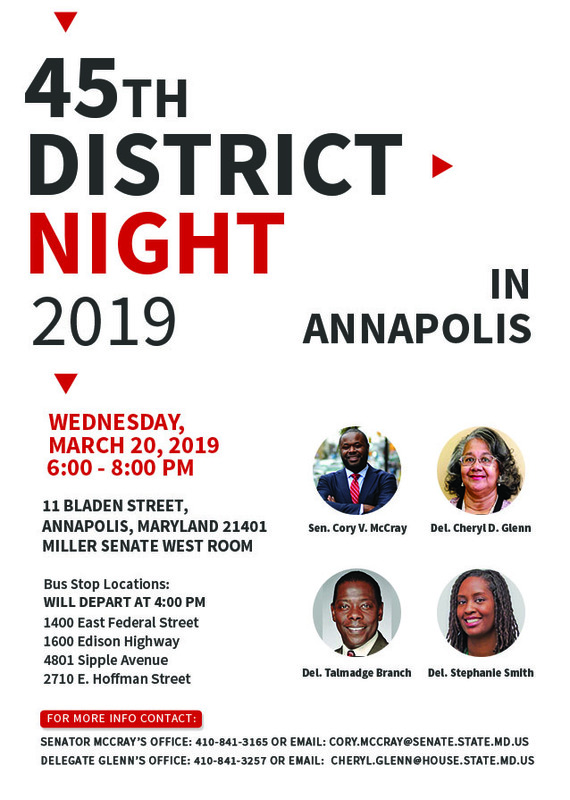 First, Wednesday, March 20 is “45th District Night” in Annapolis. We will have buses departing from four locations in Baltimore that will take constituents directly to the State House for an evening with myself and Delegates Glenn, Branch, and Smith. 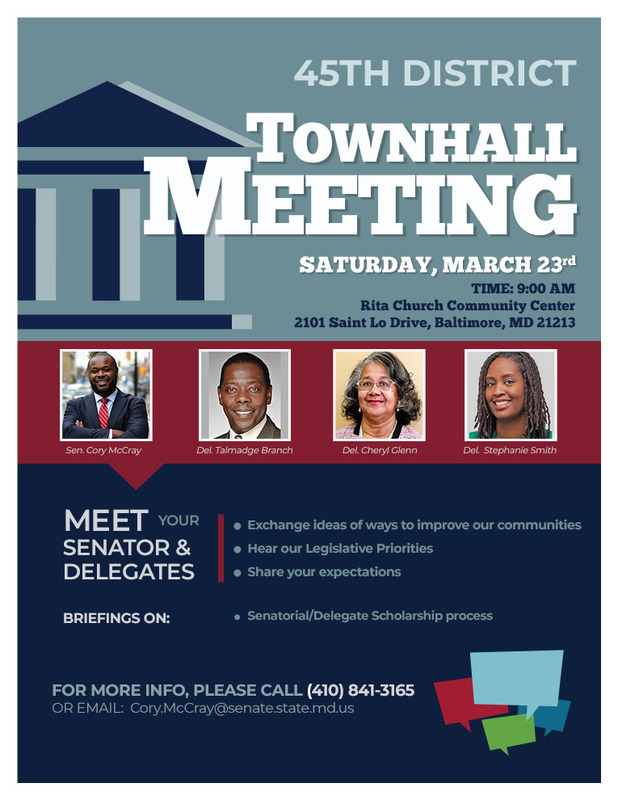 Then on Saturday, March 23, the four of us will be hosting a “45th District Townhall Meeting” at 9:00 AM in the Rita Church Community Center at 2101 Saint Lo Drive in Baltimore. Each year, members of the Maryland General Assembly award scholarships to students in their district who are (or will be) enrolled at an in-state undergraduate or graduate program. If you would like to apply for a scholarship for the 2019-20 academic year, please send me an e-mail at cory.mccray@senate.state.md.us. With February well underway, much of the focus has been on preparing to turn our ideas for legislation into state law. Below, I am proud to share a number of the initiatives that our team has been working on. Each of these initiatives is critical to our vision of a more equitable and efficient State of Maryland. 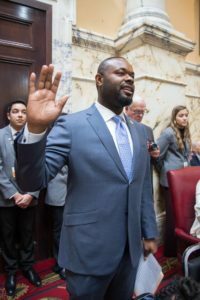 I’m proud to share that on February 7, the Maryland Senate unanimously passed Senate Bill 39, which is #TeamMcCray’s first piece of legislation to be passed this session. SB 39 will require the Baltimore City Police Commissioner to reexamine the boundaries and composition of each police district following the completion of each decennial census. This will help ensure that law enforcement resources are being deployed in the most effective manner. You can read coverage of the legislation here. The bill is now up for deliberation in the House of Delegates. We also introduced Senate Bill 229, which will add another $6 million to Baltimore’s YouthWorks program and provide 10,000 bus passes for young people seeking employment over the summer. As we continue to look for solutions for the squeegee kids and thousands of other young people in our city who have idle time during the break, the State has a responsibility to step up and provide assistance in their job search. You can read more details about our proposal here. Finally, Senate Bill 43 will allow the Mayor and City Council to require Baltimore Police officers holding the rank of “Commander” to reside within the city limits. This is a crucial step in rebuilding trust between law enforcement and communities. Commanders in the BPD are an essential part of the department’s leadership and it is important that those holding such a high degree of responsibility are a part of the communities they are tasked with serving. I was happy to learn that both Mayor Pugh and Commissioner-designate Harrison are in agreement that BPD leaders should be city residents. You can view the full list of legislation that we have introduced this session by clicking here. Of course, one of the most popular pieces of legislation being discussed this session is our initiative to raise the minimum wage in the State of Maryland to $15. I am especially proud to serve as the sponsor of this important policy priority – and look forward to working with my colleagues in the Senate and House to ensure its passage. Supporting the “Fight for $15” will have an immediate impact on working-class families and a long-term effect on many communities throughout our state. This month, I wrote an op-ed for The AFRO discussing why I’m so passionate about this bill. This month I also had the chance to stop by the Institute of Notre Dame to learn more about their mission and the incredible work being done by their students. I was particularly impressed to meet with Destiny, a senior from my legislative district who is planning on a career in broadcasting. We are fortunate to have talent all around us in the City of Baltimore, and the students and staff of IND are a great example of it. After many months of preparation, I was sworn in as the 45th District’s Senator on January 9. 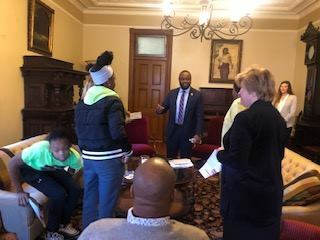 Since that time, #TeamMcCray has been at work—in Baltimore and Annapolis—on making a smooth transition and beginning to lay out our legislative agenda for the 2019 session. Prior to Day 1, we had the opportunity to celebrate with family, friends, and neighbors at a pre-session reception hosted at the Great Blacks in Wax Museum. Thank you to everyone who was able to make it. The first day of the new session was incredibly busy. I began the morning by sitting down with C4 on WBAL 1090 for a discussion about the year to come. After that, I joined Chairman Barnes and members of Maryland’s Legislative Black Caucus for a press conference supporting the “Fight for $15” initiative. And, of course, I was humbled to officially be sworn-in as a Maryland Senator. Thank you to all of those who joined us! 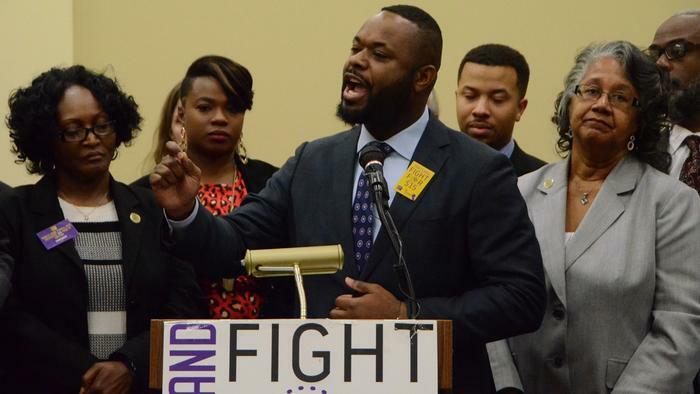 Recently, I published an article for The AFRO, in which I laid out a few ways that the Maryland General Assembly can act to improve the state of public safety in the City of Baltimore. In particular, I included the need for mandatory reporting of expenditures for long-term crime prevention solutions, updating the police districts in the city and beginning to conduct independent legislative audits of the department. You can read the full op-ed here. As the beginning of the 2019 Legislative Session draws closer, I am becoming increasingly optimistic about the goals that we can achieve in the New Year. In particular, I am looking forward to serving on the Budget and Taxation Committee, as well as the Health and Human Services Subcommittee and the Capital Budget Subcommittee. To celebrate the New Year, I would also like to invite you to a pre-session “Celebration Reception” on January 7 at the National Great Blacks in Wax Museum from 5:30 PM to 7:00 PM. You can purchase tickets or make a donation here. I recently published an article for the AFRO about the urgent need for a balanced approach to public safety that combines investments in our youth, a continued commitment to our seniors, and upgrading technological resources for law enforcement. You can read more about the Baltimore City Delegation’s vision for public safety here. 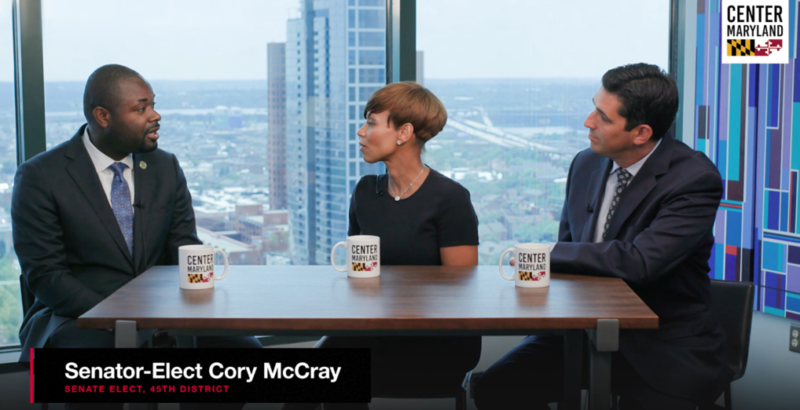 It was also a pleasure to sit down with the teams from Center Maryland and Comcast Newsmakers to talk about our legislative priorities and the upcoming legislative session. You can watch those video segments here and here. This year’s Team 45 Holiday Toy Drive was a great success. I would like to thank Function Coworking Community, Zeke’s Coffee – Baltimore, Batch Bake Shop, LemonTopia, YKI Decor and Events, Adrian Blu Moore, The DIVA Effect, Inc., and everyone who donated to make this event a success. It was wonderful to see so many people who were thinking of our city’s young people during this holiday season. With that said, I hope that you enjoy yourself over the holiday season and I wish you all the best for a productive and healthy 2019. One of the best parts about the month of November is that it always serves as a reminder to reflect on what we have to be thankful for. Whether it’s time spent with family and friends, recent accomplishments, or new opportunities on the horizon, we all should take more time throughout the year to step back and recognize the blessings that surround us on a daily basis. Among the things I am thankful for was the opportunity to once again partner with the Keystone Mountain Lakes Carpenters to give away 300 turkeys to neighbors throughout the 45th District. This marks the third year in a row that we have teamed up in advance of the Thanksgiving holiday. Continuing on the theme of giving thanks, I am appreciative of everyone who came out to the polls on Election Day to help us reach the finish line in the general election. I spent a lot of time working the Early Voting locations and enjoyed meeting and reconnecting with all of the neighbors who early voted. 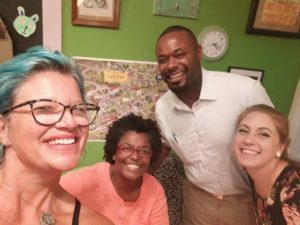 With the election now in the rearview mirror, I am looking forward to getting down to work in the upcoming legislative session and collaborating with Delegates Talmadge Branch and Cheryl Glenn, who were successful in their respective re-election efforts, as well as Delegate-elect Stephanie Smith – each of whom will be representing the 45th District in Annapolis. I was proud to join Dr. Bhutta and our recently re-elected Attorney General, Brian Frosh, for a discussion at the University of Maryland Medical Center on toy safety. Especially as we head into the winter holidays, it’s important for policymakers and families to consider the importance of requiring high standards for toy manufacturers so that our children are only playing with safe products. I encourage you to read the Maryland Public Interest Research Group’s full report here. In recognition of American Education Week, I spent some time at Hamilton Elementary-Middle School, AFYA Public Charter School, and the Stadium School. I also dropped by Henderson Hopkins to speak with the sixth grade students about civic involvement. 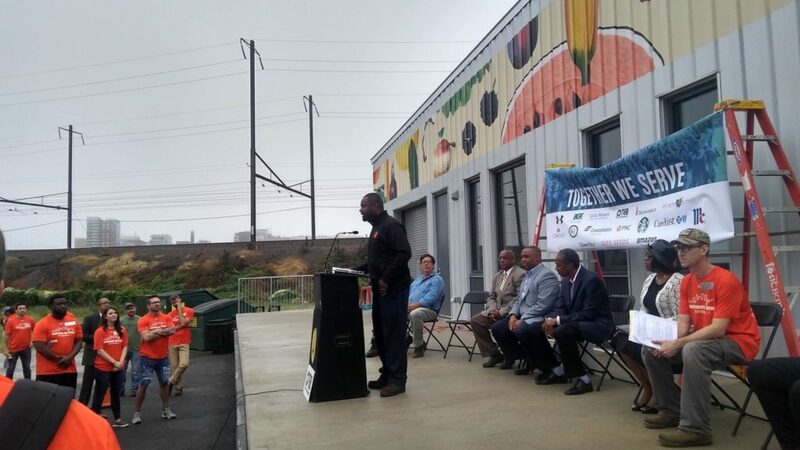 It was also a great honor to speak at the Senior Inauguration at the Baltimore New Era Academy, where I discussed the potential for greatness and the importance of giving back. The investment that we place in our young people today will pay tenfold in the future, and it was my pleasure to talk with the young men and women who one day will be leading our City and State. 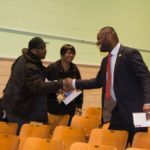 It was great to be a part of community meetings this month in Frankford Belair-Edison, New Broadway East, and Mount Vernon. Our communities are made stronger by having engaged neighbors who are invested in their neighborhoods and I enjoyed speaking to those who came out. September was a busy month for #TeamMcCray. From attending events in the community to speaking with the media about the upcoming elections, my team and I have had our hands full. Speaking of the election, make sure that you are registered to vote! If you aren’t already registered, you’ll need to submit your application by October 16 in order to vote in November. You can check to see if you are registered here. This year marked the 17th Anniversary of the tragic events that took place on September 11, 2001. Over the past 6 years, I’ve honored the men and women that we lost in the attacks by participating in a “Day of Action” with The 6th Branch, an organization led by veterans. 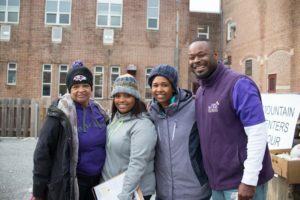 The 6th Branch is committed to brining people together and lending a helping hand in some of the most challenging neighborhoods in East Baltimore. It was a real privilege to commemorate 9/11 once again with the incredible folks at The 6th Branch and with all of the volunteers who joined us for the day. Harford Road for First Fridays. Senator-Elect Mary Washington and I had the chance to talk education policy with small business owners from the 43rd and 45th Districts. Once official business was taken care of, it was good to relax and chat with neighbors at this year’s Belair-Edison Wine Festival. Thank you to all who joined us for our Celebration Fundraiser! The evening was a tremendous success and it was a valuable opportunity to express gratitude for the neighbors, friends, and colleagues who shared our vision and passion and made it possible to get to this point. Towards the end of the month, I headed to Washington, D.C. for my first tour of the Supreme Court of the United States. It’s one of the most impressive buildings in all of D.C. and I was fortunate enough to spend part of my visit talking about the Court with Justice Samuel Alito. It’s an exciting time for Baltimore. It was clear after the June primary elections that a new generation of leaders will be representing our City in the statehouse. With new leadership comes new ideas and heightened energy. I’ve been grateful to speak about our vision for the next four years on numerous occasions over the past few months. 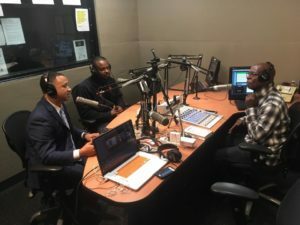 Recently, I stopped by the “Patrick Henderson’s Meet the People Radio Show” on WOLB with Senator-Elect Antonio Hayes. I also joined Senators-Elect Hayes and Washington on WBAL. We’re down to less than one month until the 2018 Midterm Elections. Maryland has a number of highly contested races, including the gubernatorial race, which means that Democratic voters will have to hit the voting booths in large numbers. It was great to spend time in Anne Arundel County knocking doors with my colleague Delegate Pam Beidle and the rest of the 32nd District team, and to volunteer for Sarah Elfreth, who will be a fantastic State Senator for District 30. 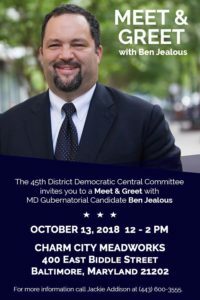 On Saturday, October 13, the 45th District Democratic Central Committee is hosting a meet and greet with Ben Jealous, the Democratic Nominee for Governor of Maryland. Please register to attend on Facebook – and we look forward to seeing you at the Meet and Greet from 12:00PM – 2:00PM at Charm City Meadworks. 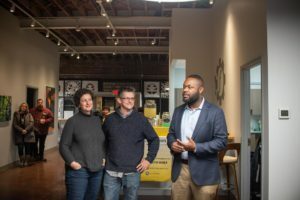 As you might have noticed, I took some time off from the blog over the past couple of months as my team and I devoted our efforts to finishing up the primary campaign and planning for the future. In the political world, it’s often said that campaigns are hard not just on the candidate but on their entire family. I know that I’m grateful for the patience of my wife and children as we embarked on a tough nine-month journey. After the success we enjoyed on Election Day, I made a conscious effort to jump right back into my kids’ recreational activities. We’ve been spending our Saturdays at the Y on 33rd, where the girls are occupied with gymnastics and the boys are enrolled in art class. And on Sundays we’re back at the Y so three of them can spend time at the pool. Summer also brought with it a chance to catch up on a favorite hobby of mine: reading. As much as I enjoy reading whenever I can, the schedule of the campaign left little spare time. I was excited to sit down with a copy of “Team of Rivals: The Political Genius of Abraham Lincoln” by the historian Doris Kearns Goodwin. “Team of Rivals” recounts the history of President Lincoln’s cabinet and their ability to put aside past differences for the good of the nation. It was fascinating to learn more about how national political figures of the time viewed their role not just as politicians but also as statesmen. I found it to be a fitting lesson for our present moment in history. If you’re looking for an informative, engaging, and timely read, this is it. School is back in session as of today and I was proud to help get some of our students prepared for the upcoming year. For our young people who aren’t as fortunate, the start of school can be a stressful time because of the cost of school supplies. 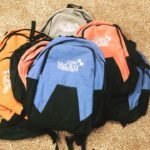 We helped out by purchasing book bags full of back-to-school gear. We still have a few left, so please reach out if you know any young people in need. All you need to do is hit “reply” on this e-mail and include your name and phone number. I was honored to meet with the newly elected 45th District Central Committee last month. 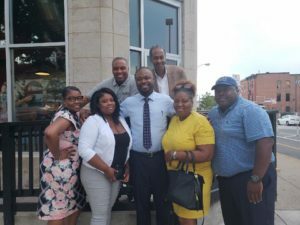 Not only were we able to break bread and get to know each other better, we were also able to formally begin discussing our vision for the 45th District. I’m looking forward to working with each of them as we near closer to session. In addition to meeting with the Central Committee, I’ve been in constant meetings to become more acclimated with the procedures and operations of the Maryland State Senate. Already I’ve sat down with Senate President Thomas V. Mike Miller, Jr. to discuss possible committee assignments. I’ve also met with several of my colleagues, Baltimore City Planning, Kaiser Permanente, the Interim President of Baltimore City Community College, President Jay Perman of the University of Maryland – Baltimore, the Downtown Partnership, Mayor Catherine Pugh, Attorney General Brian Frosh, the Maryland Health Initiative, and AFSCME. I also toured ReLeaf, a medical marijuana dispensary in our district, and met with the owner – and toured one of the growing facilities in Carroll County. I’m planning to keep up a busy schedule of meetings over the next several weeks so that I’m fully prepared for January. Finally, I’ve enjoyed getting together with the five other incoming Baltimore City senators to discuss potential legislative priorities and the process for implementing the recommendations of the “Kirwan Commission” that has been taking a look at education funding in the State of Maryland. This will be one of the most important issues for legislators to examine when we head back to Annapolis. On Monday, May 28, our nation will commemorate Memorial Day. I implore you to take some time between burgers and hot dogs to reflect on the true reason for the occasion: honoring those who have died in service of their country. It can be easy for all of us to take for granted the blessings we enjoy on a daily basis. Memorial Day reminds us of the true cost of the freedoms we so enjoy. I hope everyone has a safe and enjoyable holiday weekend. The primary election is just about one month away (June 26), which means our campaign for State Senate is operating at full speed. I’ve been humbled and encouraged by the support that the campaign has garnered since our announcement in October. As we near the end of our primary journey, I’m looking forward to spending as much time as possible over the next month being out in the community, knocking doors, and reintroducing myself to neighbors in the 45th District. I hope to see you along the way. As the election nears closer, I’ve been fortunate to talk about my record and vision for the 45th District in a number of venues. I enjoyed participating in the No Rofo Debate, AKA Senatorial Forum, and Belair-Edison Candidate Forum. Over the last 8 months we’ve also logged in over 7,500 phone calls to constituents and knocked on more than 25,000 doors. That’s a lot of walking and talking – and we have no intentions of slowing down. Through each phone call and stop along the campaign trail, I’m reminded of just how high the stakes in this election are. As I’ve said before, it is time for Baltimore – and the 45th District, in particular – to get its fair share of state funding and resources. As your State Senator, I’ll be committed to ensuring that happens, and will always be a zealous advocate for our neighborhoods and communities. In non-campaign related news, I’ve enjoyed meeting with the 45th District Scholarship Committee to begin making decisions on which applicants will receive a Senatorial Scholarship from my office. We look forward to awarding a number of well-qualified and promising young individuals with funding that will help defray the cost of their college education. I recently submitted my responses to questionnaires distributed by the Baltimore Sun and the League of Women Voters, respectively. I encourage you to take a look at my thoughts on the important issues that voters will be weighing in the upcoming elections. 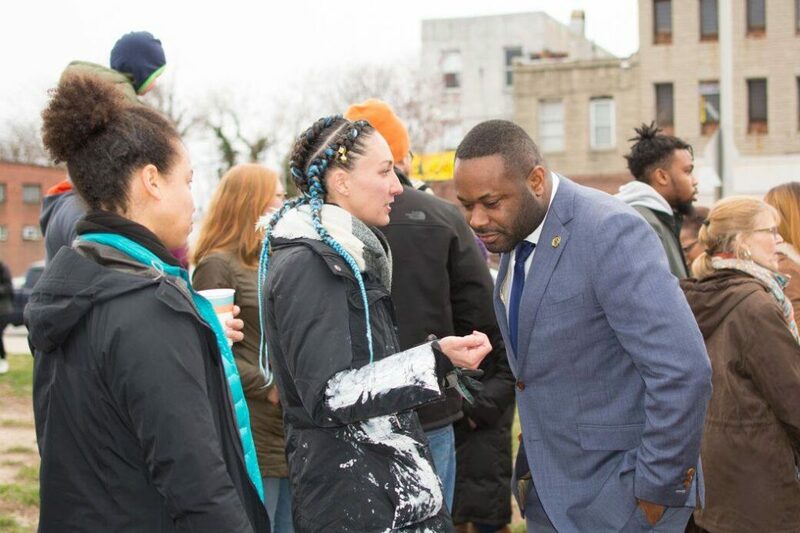 Thoughtful and progressive stances on these consequential matters have earned our campaign the backing of a number of influential organizations, including: SEIU 1199, Progressive Maryland, and Our Revolution. We also recently received an endorsement from Mr. Kowon Williams of Belair-Edison. I am so thankful to each of these groups, and Mr. Williams, for taking time to consider both of the candidates in the race and for demonstrating confidence in my ability to enact an agenda most favorable to the residents of the 45th District. Of course, in order to win we’ll need your endorsement on the ballot! Remember to vote on June 26 (or during early voting: June 14-21). Additionally, you can show your support by showing off a lawn or window sign and/or by adding a bumper magnet to your car. It’s the easiest way for us to get the word out about the campaign. If you’re interested, we’ll arrange for one to be brought directly to you – all you have to do is fill out this form and we’ll take care of the rest! 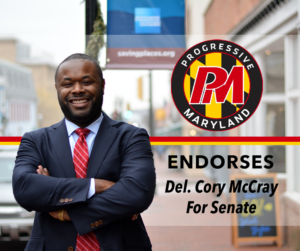 Another great way to support our efforts is by making a small donation to #TeamMcCray. You can do so here. We appreciate your generosity. Finally, early voting gets started in less than a month – and absentee ballots can be requested now through the Maryland State Board of Elections. If you have any questions, please feel free to reach out to us. This month I completed my fourth and final Legislative Session in Annapolis as your State Delegate. It has been an honor to spend my term furthering the interests of the 45th District. The past four years have been full of enacting meaningful and necessary legislation – but also, and more importantly, forming relationships with those whose lives will be affected by the work that is done at the State House. My team and I have always valued the constituent services we provide above all else and I am honored to have had the opportunity to meet and serve so many fellow neighbors in the 45th. As we get closer to the primary election on June 26, I hope that I’ll have the opportunity to earn your vote – if I haven’t already – to be elected as your next State Senator. This year’s session began with both chambers of the Maryland General Assembly acting to override Governor Hogan’s veto of the Maryland Healthy Working Families Act. This act requires companies with 15 or more employees to provide up to five days of earned sick leave annually. Companies that employ less than 15 employees will have to provide unpaid leave under the same conditions. The “Ban the Box” legislation prohibits colleges and universities in Maryland that receive state funds from asking about prospective students’ criminal history on their initial application for admission. This will allow all applicants, regardless of prior history, to have their application reviewed and considered on the merits. HB 1783 invests up to $400 million in school construction on an annual basis, creates a $10 million annual grant for school safety improvements, requires an assessment of Maryland’s school facility inventory, streamlines the school construction project approval process, and removes partisan gamesmanship from school construction funding decisions. The Healthy School Facility Fund will provide up to an additional $30 million for vital HVAC projects in schools throughout the state. Up to $15 million of these funds are available for projects in Baltimore City’s public schools. This bill requires defendants convicted of domestic abuse to transfer all firearms under their ownership within 2 business days of their sentencing. Simply put, those with an abusive past will no longer be allowed to lawfully posses a dangerous firearm – and it will be easier for law enforcement to ensure that those with a proven record of violence are kept away from firearms. Could there be any better time to return full-time to the district than right around the start of this year’s Light City Baltimore? It is truly an awesome occasion to embrace all that our city has to offer. Amidst the festivities, I had the chance to stop by Darley Park to celebrate with the community. Thank you to everyone who’s come out over the past two weekends! 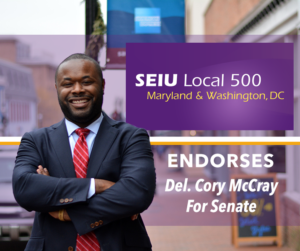 As session was wrapping up, we also received an endorsement from the SEIU Local 500. As you know, I have spent my time in public service dedicated to making Maryland a more equitable place, especially for hardworking families in Baltimore. If I’m fortunate enough to be elected to the State Senate, I’ll continue to be a voice for union employees throughout our state, leading the charge for a living wage and quality, affordable healthcare for all. The primary election will be here before you know it. We’ve had tremendous momentum from the moment we announced but we’ll need your help to carry it across the finish line. In addition to voting on June 26 (or during early voting: June 14-21), we ask that you show your support by showing off a lawn or window sign and/or sporting a bumper magnet on your car. It’s the easiest way for us to get the word out about the campaign. If you’re interested, we’ll arrange for one to be brought directly to you – all you have to do is fill out this form and we’ll take care of the rest!